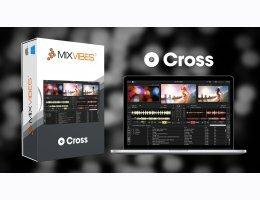 With Cross, it's easy to find and prepare your audio medias, allowing you to keep your focus on the dance floor. Powerful BPM detection: Cross DJ finds the BPM of your tracks and syncs them. You can also adjust grids for tracks with loose BPM. Key detection and control - Create smooth, harmonic mixes. Compatible tracks are highlighted in orange. Pristine sound quality - Cross supports all major music formats. Album cover browser for visual search. Cross includes a lot of professional features, allowing you to release your creativity to make every mix differents. Multiple routing modes to accommodate various audio set-ups. High-end master tempo & hybrid pitch allowing speed change while keeping the original tonal Key (note). Cross allows you spin audio files using timecoded Vinyls/CDs and/or MIDI controllers. External Control with MixVibes control Vinyl/CD. Authentic vinyl control with 2 vinyl driving modes - Absolute and Relative (for loops). Powerful anti-skip mode, realistic sound even at low speeds. Best time code CD resolution for hot CUEs and short loops. 2x 12-inch control vinyl and 2 control CD records included. Popular MIDI controller presets included and MIDI learning feature to map your own USB device. Cross is compatible with numerous MIDI controller. If your controller is not listed below, you can map your own controller with the MIDI Learning feature. Denon DN-HC1000S, DN-S1200, DN-S3700 (Hybrid Mode), DN-SC2000, DN-MC6000. DJ-Tech i-Mix, i-Mix Mk2, i-Mix Reload, i-Mix Reload Mk2, VTT-101. Hercules DJ Console Rmx, DJ Console Mk4, DJ Control Steel, DJ Control MP3 e2, DJ Console 4-Mx, DJ Control Air. MixVibes U-MIX CONTROL, U-MIX CONTROL 2, U-MIX CONTROL PRO, VFX CONTROL. Numark iDJ3, Omni Control, Stealth Control, Total Control, Mixdeck. Pioneer CDJ-350, CDJ-400, CDJ-850, CDJ-900, CDJ-2000, DDJ-ERGO, MEP7000 (SEP-C1), DDJ-Ergo. Reloop Digital Jockey, Digital Jockey 2, Spin 2+. Vestax PMC-05ProIV, Typhoon, VCI-100/VCI-100MKII, VCI-300/VCI-300MKII, VCM-100, VCI-400.